It is hard to believe the areca palm (Dypsis lutescens) was once an endangered species. Drive down almost any street in a subtropical or warm climate, and you are likely to see dozens of these tall, attractive and clumping palms that look a lot like bamboo. The palms have smooth, sometimes golden trunks that are reminiscent of bamboo culms. Their fronds are narrow and full, almost like bamboo leaves. When sold as indoor plants, areca palms typically are clustered in small pots and look somewhat like palm grass. 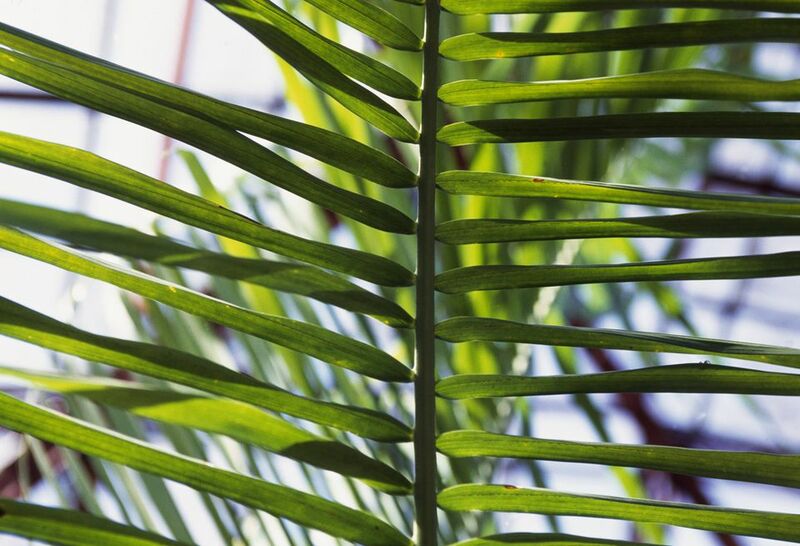 However, there are two reasons they are not the best palms to grow as houseplants. They need fairly bright light and they are especially sensitive to the buildup of fertilizer salts. But if you are looking for a good short-lived palm for indoor growth, the areca palm is a popular and relatively inexpensive option. Areca palms present the home grower with multiple challenges. There is the seemingly eternal quest for light that frustrates many growers of palms. They like more light than the average indoor environment can supply. Also, there is the persistent challenge of feeding. Areca palms are heavy feeders that can develop yellowing leaves in the absence of magnesium, iron, and trace elements. However, they are also susceptible to fertilizer salts and dislike fluoridated water, which puts many growers at a disadvantage. Areca palms do best with bright light like from a south- or west-facing window and may last longer with some direct sunlight. But do not give too much direct sunlight, the leaves will turn yellowish-green in direct sunlight. A peat-based mix with lots of material for drainage is perfect. Palms appreciate good drainage to prevent waterlogged roots. Like many palms, areca palms are sensitive to overwatering and cannot tolerate being waterlogged or sitting in water-saturated potting mix. Let the potting mix dry out slightly between waterings. This plant does best in average room temperatures of 65 to 75 F. Keep the leaves away from cold windows, air conditioners, and heat sources. Areca palms are sensitive to low temperatures so if you place it outside during the summer be sure to bring it in before temperatures dip below 50 degrees. Sudden cold spots can bring on dark spots in the leaves. High humidity is essential to keeping an Areca palm looking good. The plant will acclimate to normal room humidity, however, if the air is too dry, it is common for the leaf tips to turn brown. Feed with a weak liquid fertilizer once or twice during the growing season and not at all during the winter. Areca palms are relatively fast-growing and are usually planted in clumps. Over time, they form clumps on their own as well. In most indoor situations It is unlikely that an areca palm will live long enough to need frequent repotting. But if your palm thrives, you may need to repot it every other year or so. They also tend to do well when slightly underpotted. When repotting a clump, be careful not to damage the root ball or bury the palm too deep. The plant likes a tight container. Crowded roots will aid in keeping the plant size in check. You want to repot in order to replace the old potting soil and remove fertilizer salt deposits that build up. When repotting, use a palm potting soil. Or, you can use a general purpose soil amended with a cup of clean builder’s sand. Areca palms are planted from seed, usually many seeds to a single pot or cluster. It is unusual to find areca palm seeds, but if you do, you can germinate them at home by planting them at a uniform depth in the seed-starting soil. Orange-colored seeds, which are older, have a better germination rate than newer, greener seeds. Germination takes about six weeks under the best conditions with soil over 80 F and relatively high humidity. The popular areca palm is the Dypsis lutescens, which is planted heavily all over the world. There are a few other related palms, including the triangle palm (D. decaryi) and betel nut palm (Areca catechu), but these are rare outside tropical or subtropical regions. Areca palm is one of the few palms that can tolerate trimming without serious harm, making it possible to keep mature plants indoors for their full lifespan of up to 10 years. Several leaf-spotting fungi attack areca palms. The end result is a palm that has a fairly narrow range of tolerances and is not likely to last long. Rather than fret over it, it is probably better to discard yellowing or declining areca palms and replace them. Areca palms are vulnerable to pests, including mites, aphids, mealy bugs, scale, and whitefly. If possible, identify the infestation as early as possible and treat with the least toxic option.